A UI kit is a life saver when you have to build something new that too quickly. With the features that a UI kit offers, you might not want to miss the opportunity of grabbing one. At this time of the year when designers are inundated with work, we bring you a whole bunch of UI kits that will not only make your designs beautiful but also save you a lot of money. Grab these 5 superlative UI kits for FREE! Shapes mobile UI kit is a magnificent iOS UI kit crafted to inspire your next app design. Its transparent elements and smooth edges offer a fresh and slick appeal. The variety of elements and screens represent a great solution for a complete mobile application. A flat UI kit to bring your web project to par with current design trends. As usual it comes with a ton of elements to satisfy even the most exigent needs. If you are looking for a modern flat feel that make websites stand out from the crowd, you will not go wrong picking this UI kit. The good part is that all of these UI kits have some features in common. They all come with layered PSD files. You get a commercial license to use with any project. All 5 kits are available as an instant download. All files are PSD files. No support will be provided. 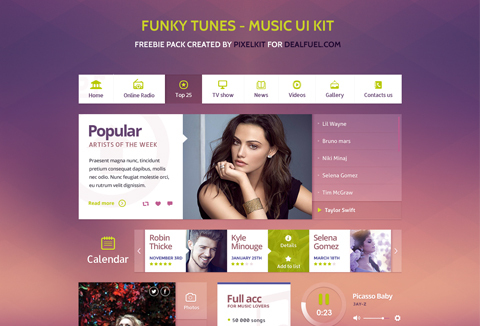 Ready to grab these 5 beautiful UI kits for FREE today?